In October 2017, our family took an 8-day/5 port Diamond Princess cruise around Japan. My husband is partially disabled, so having one place to call “home” for the week (with meals included!) while we visited places all around the country was ideal for our first time visit. Thanks to Accessible Japan, we were able to reserve a motorized wheelchair for our trip. It was a standard wheelchair with a motor and joystick attached. It folded down for storage, and we charged the battery pack every night (standard nickel, 15 km range, which was plenty). The company, Pamuk, did delivery and pickup in person. The cost was somewhere around $120 USD for the week. We did not get an accessible stateroom, opting instead for a better location on the ship. We will rethink this next time! An unexpected downside was that the hallway was nearly always blocked by the cleaning carts! This was extremely frustrating for my husband, who ended up having to walk more than he really was able to. We thought perhaps after the first incident that the stewards would be conscious of his needs and adjust, but that was not the case (and in fact it seemed worse as the trip went on). Maybe an accessible room would have more hallway clearance, and stewards more in tune with needs. Overall, the ship was wheelchair accessible, with a few minor exceptions (such as the tiny mini-golf area). Other areas were accessible, but not ideal (for example, the theater seating for us was at the very top/back). The elevators were also very slow and difficult to catch. Inconveniences, but noteworthy. any real system in place for their disabled passengers. We often waited a very long time, or in the “wrong” line, and the process for getting a wheelchair on and off of the ship was confusing, frustrating, and at times humiliating. There were a couple of times they utilized ramps, but for the most part they only had stairs available, and insisted on manually carrying my husband in his wheelchair up or down. Not only was this dangerous, it was embarrassing for my husband to be “handled” this way. A couple of times he just gave up and struggled with the stairs (also dangerous for him, and exhausting). I am sorry to say that the attitudes of the crew made this even worse. The excursion categories (“Easy/Moderate/Strenuous”) were quite accurate. Only the “Easy” ones were completely accessible. The others had varying degrees of accessibility. We did the best we could, and the tour guides were exceptionally mindful of my husband’s needs. They made sure he had a reserved seat at the front of the bus, and helped load/unload his wheelchair underneath. The busses were not made to accommodate wheelchairs in the passenger area, so he did have to use the stairs to get on and off. This could be a game-stopper for someone who cannot walk at all. 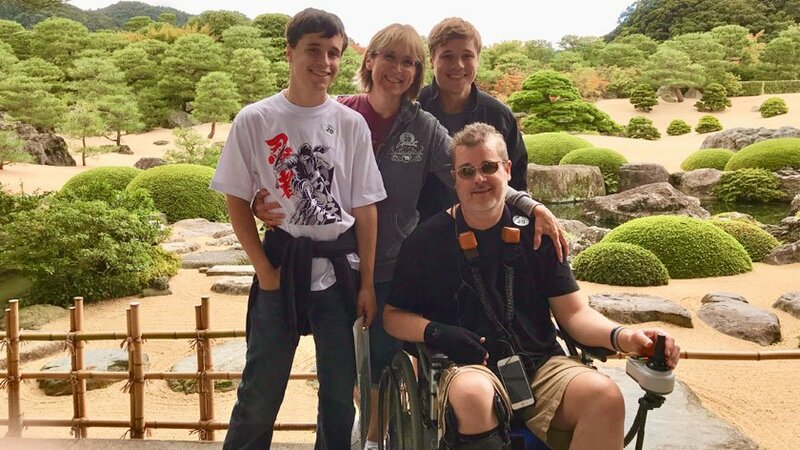 While a cruise can be a good way for a disabled person to get a taste of Japan (especially for the first time), next time we will look for a cruise line and ship that is more disabled-friendly. We might even venture out on our own! We found that the Japanese people are overwhelmingly kind and ready to help as needed. Accessible Japan was also an invaluable resource. We encourage you to not let any disability hold you back from visiting this extraordinary country!